It is well known that London has become one of the most amazing places in the world to enjoy an evening out because of its zillions of incredible restaurants: from cosy to vibrant, from Michelin starred to fast food, from romantic to children friendly, London has something for everyone. So many choices and so little time! Here are a few of our favourite places. There are so many cheeses that this is sometimes difficult to select one and know how to match it with a nice bottle of wine. La Cave à fromage will help you discover new varieties of cheeses in a very friendly and relaxing atmosphere. The selection changes every day, so you can be sure you will never have the same evening twice. If you had a particular liking for one of the cheeses, a bottle of wine or some of the charcuterie, then you will be able to purchase it in the shop before leaving. La cave is open every day and organises cheese and wine tasting every Thursday evening. 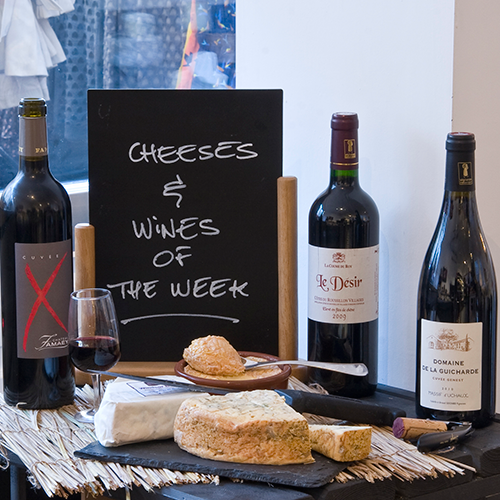 For £35, you can try 6 different cheeses with wines to match. Discover their selection in their modern, light and airy shop on Portobello Road, with multiple space options from the shop floor, the Tasting café and the Wine Room. To win a tasting evening for two, please click here. London offers an incredible number of theatre venues every evening. Are you planning to have dinner before a show? Côte Brasserie proposes an early evening menu during weekdays from noon to 7pm. You can enjoy two courses for £10.95 or three courses for £12.95. On the menu, guests will always find brasserie classics such as steak frites, tuna Niçoise and moules marinières. For dessert, Côte’s crème caramel and classic crème brûlée are much–loved house specialities. The extensive wine list features wines from a variety of producers across France. 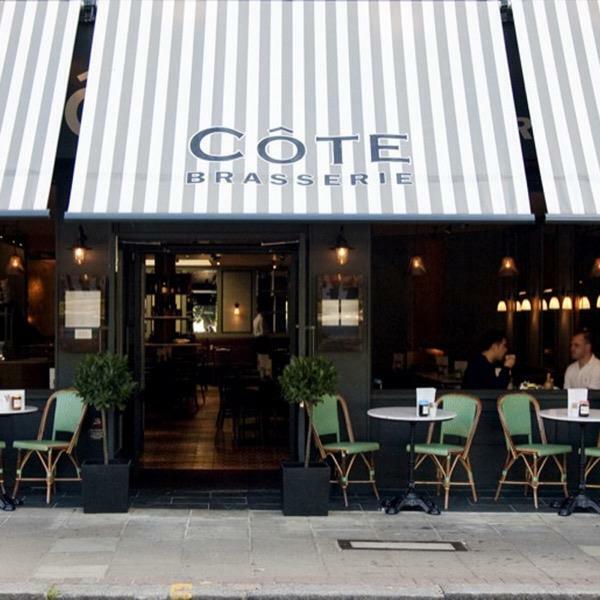 For the 5th anniversary of their Ealing brasserie, Côte is offering a £70 meal voucher for two. To enter the competition and win a 3-course meal and a bottle of wine, please click here. 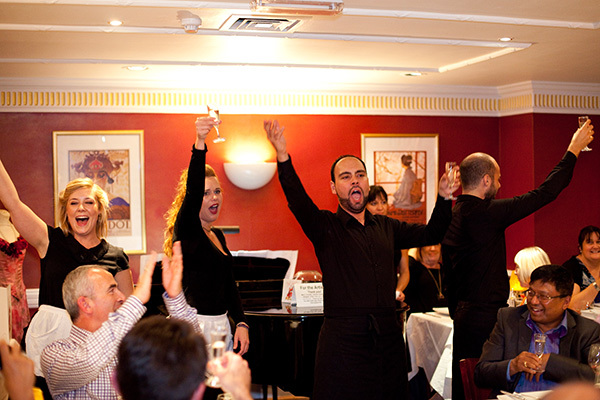 For a dinner with a difference, opt for an operatic aria. Bel Canto is the only restaurant in London to offer world-class opera with fine French food. This restaurant’s warm and welcoming atmosphere is the perfect setting to enjoy a repertoire of both well-known and less familiar arias sung by professional opera singers. Open from Wednesday to Saturday from 7:00pm to 11:00pm, Bel Canto proposes a 3 course meal for £59, with a live opera show and a glass of prosecco to toast with the artists. Are you after a romantic time with your partner in a chic restaurant? The one Michelin star restaurant Pied à Terre welcomes you with delicate dishes and a comfortable modern and atmosphere. 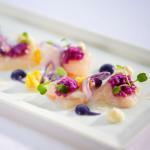 Their chefs will delight you with their morels turbot, Cornish cod with pink grapefruit and miso butter or fallow deer with fregola and black curry. 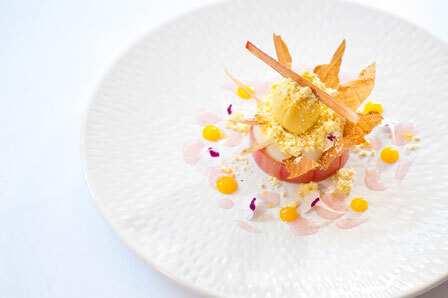 For the dessert, opt for the peach millefeuille or poached rhubarb. The restaurant has its own herb garden, so eerything taste extra fresh.